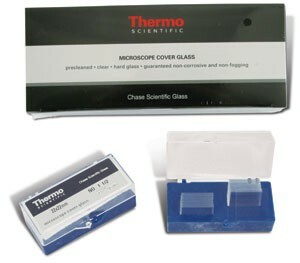 Microscope cover glass is a very thin square piece of glass that is placed over a drop of liquid on a microscope slide. Because of surface tension, the liquid drop alone tends to sit in a thick dome. With a cover glass in place, the drop is flattened out, allowing the analyst to focus with high power very close to the specimen. The cover glass also confines the specimen to a single plane which reduces the amount of focusing necessary. The cover glass also protects the objective lens from immersion into the liquid. #1.5 coverslip is recommended for oil immersion or high resolution work.